Hawker vendor assembles laksa take-out (in a bag). My bowl of laksa, with the prawn paste dumped out of the spoon before I remembered to take a photo. 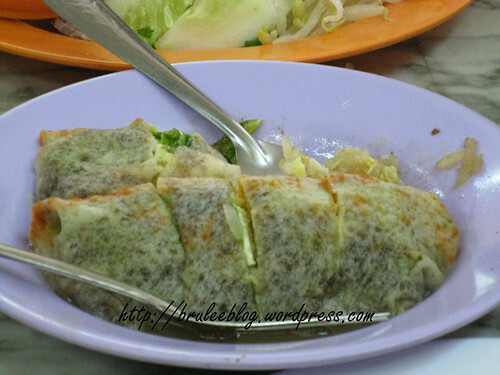 A second dish we ordered was popiah from another hawker stall at Kek Seng. Popiah is a lot like a giant fajita or spring roll, but with a much thinner crepe-like wrap. It is usually filled with various vegetables like jicama and bean sprouts, and can include meat like scrambled eggs, shredded pork, shrimp, or crab. Ours was a little soggy, but I loved the fresh taste of the vegetables, and between my grandmother and myself we polished off the plate. No one else wanted some. Their loss, my gain. And for dessert, we ordered a dish of ais kacang (also known as ice kacang, pronounced “ice ka-chang”). 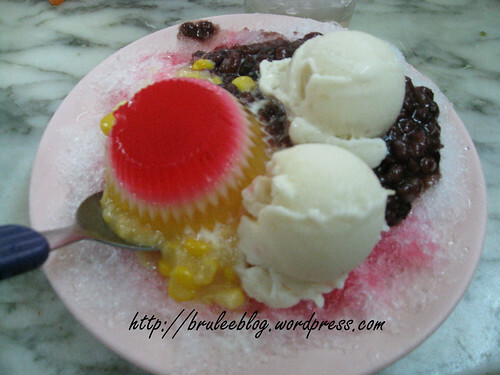 Ais kacang is basically shaved ice with milk (condensed, coconut, or evaporated with added sugar), red beans, and other syrups and/or fruit added on top. At Kek Seng, they serve a famous homemade durian ice cream so ours was served with that, along with creamed corn, an agar agar jelly, and I think what was a rose syrup but I can’t recall for sure. (Yes, corn for dessert again. Those crazy Asians and their love of corn!) I took a couple of bites just to try the dish, but it wasn’t something that I necessarily enjoyed due to personal preference. The ice cream tasted like durian. Bleh. Supposedly it was good. I would have preferred to just have red beans and maybe the jelly. 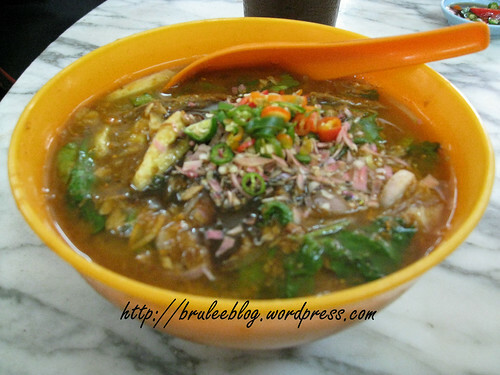 Want to make your own Penang assam laksa? Check out this recipe from Rasa Malaysia. Don’t count on finding any ginger flowers in Canada or the U.S. though. Edited to add: Found some dried ginger flowers! That dessert is certainly different. I’m not big on desserts. The laksa sounds and looks incredible! I’d love to try that. All the food memories you have shared from this trip sound amazing! Ah, that explains it then. We ended up going there twice and I really want to go back for another visit! Oh and I found dried ginger flowers here where I live, and got very excited. They’re not as good as the fresh stuff but I figure it’s better than not having it at all.